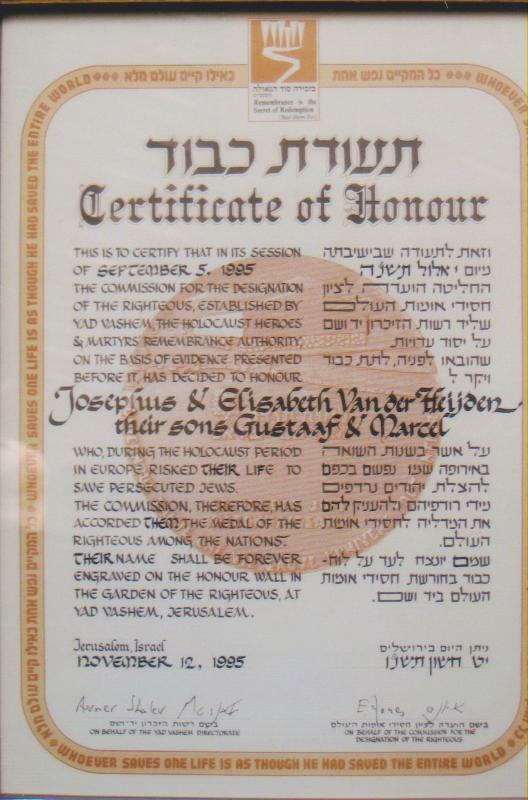 Yad Vashem provided me with a copy of the following address given by one of the surviving van der Heijden sons. The copy provided did not include the name of the speaker but it has been identified by Hildegard Raven-van der Heijden, a daughter of Eugene, as having been given by Sjef van der Heijden. “Your Excellency, Ladies and Gentlemen. Shalom. My sister Elly and I are very proud to be here with you, to represent the family from Europe of the four victims we remember today. It is also with pride that most of our wider family members in America are here today too, living proof that the memory of our father, mother and brothers did not dissolve and become lost in time. Now, by the engraving in the wall of the Yad-Vashem-Monument in Jerusalem and by the inscription of their names in the Holocaust Museum in Washington, they are immortalized for future generations. We are really very proud. Who were father and mother Van der Heijden? They were the parents of a simple family who lived in a small village in the south of the Netherlands on the Belgium border. They had no great political aspirations, and could never foresee the horrors that lay ahead. It was without saying that they used their kindness and humanity to help any fugitive in need. We, my sister Elly and I, were very young at the time, 8 and 13, but we remember every detail. For example, we remember our mother bandaging the bleeding feet of an innocent 18-year-old German farmer’s son who had marched for miles on the first day of the occupation of The Netherlands. I think my mother was living in the spirit of the Bible, which says you can love your enemy too. A few days later, my eldest brother, Marcel, found two French prisoners of war hiding in the forests of Hilvarenbeek, the name of the village where we lived, and brought them at night to our home. These were the first of many, followed by English prisoners of war, Dutch students, and then in 1942, the first Jewish refugees. Elly and I remember some of their names to this day: Mr. Citroen, Mr. Vigeveno, Mrs. de Leeuw with her husband and three little children, the famous Jewish singer Ré Koster and her husband, and many, many others. In a later phase of the war there were American refugees too. I remember one name, Mr. Applewhite, who still lives in America. But the most of all I remember my waiting mother, Elizabeth, who held my hands in hers for hours when I returned from imprisonment to her and my brave sisters Lisette and Elly, who lived in great fear with mother in our home until the Germans evicted them. I remember my mother, waiting for her husband, who we now know, died on 25th April 1945 in Bergen Belsen. And I remember my mother, waiting for her son Gustaaf who died in 1945 in Neuengamme, another concentration camp. And again I remember my mother, waiting for her eldest son Marcel, who died in terrible circumstances in the harbour of Lübeck. My sister Elly and I remember so much; too much to speak about. I hope now for only one thing and that is, all the dirty wars will one day belong to the past and that no more simple and innocent people will be sacrificed. Most likely a too optimistic hope, I think. I would like to finish with a quotation from a book, There’s a Way to Freedom–Seven Months in a Concentration Camp. This book was written by Dr. Hemelrijk, a Jewish friend of my father in Bergen Belsen, who returned after the war. I looked for comfort from other prisoners. Mr. Van der Heijden, a cigar manufacturer from Hilvarenbeek, was sitting opposite me next to a Frenchman. I sat between them and stayed with them for a few days. The Frenchman had oedema and very bad feet, because he had no shoes. His soles were almost hanging off. He asked me to examine his legs and for advice, but I could give him none. He was a simple farmer from the north of France, who in his thoughts was still on his farm. Mr. Van der Heijden was also a very simple man and very religious. Two of his sons were prisoners, but in another camp, which worried him greatly. But he did not despair. “I think of my home and my family and I pray a lot,” he said to me in confidence. He often sat in quiet meditation, as if the terrible circumstances in which he found himself did not exist, and he hoped for the miracle of liberation. When that happened, we agreed, I would visit him at his home in Hilvarenbeek, because it was so beautiful there. Because he gave me his trust and confidence I felt very close to him. I promised to visit him at Easter, but without a shadow of a doubt this is what kept him going. I was not, however, able to keep my word, because he never came back. Maybe it was for the best, because his sons did not see liberation either; they also died in Germany.